the price we offer is very reasonable. 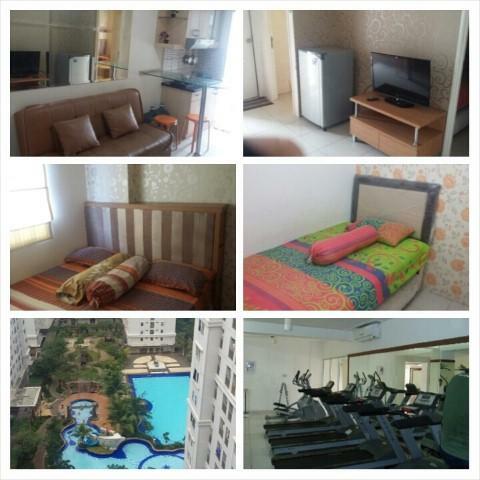 Condition: Nice & comfort, Furnished: 2 A/C unit, modern kitchen set with cooker hood + stove 2 burn, refrigerator, sofa 2 seaters, mini bar & chairs, AQUA galon, wardrobes in master room, divan & mattras + bed sheet, gordyn, TV + credenza. Bathroom: standard shower. 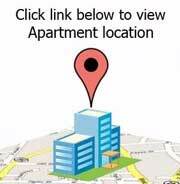 Access card, TV cable channels, 24 hours security with CCTV & lift access, futsal court & Basket court, Food court, garden view. Facility for Green Palace Apartemen: Lobby Receptionis, Mail Box, swimming pool, fitness, sauna, jogging track, basket & tennis court. Mini Market, Salon, coffee shop & bakery, Restaurants, health & medical clinic, Cinema, children playground, gazebo. Banks & ATMs center. Near access to Halim Perdana Kusuma Airport. 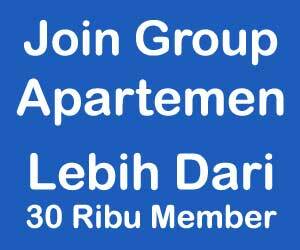 Easy access to public transportation (TAXI, two Busway corridor, TRAIN / Commuter Station). Near & easy access to Business District in Pancoran, MT Haryono, Gatot Subroto, Mega Kuningan & Sudirman. Near to international business school. Near to medical clinic & hospital, medicine shop. Easy access to Mall Square Kalibata City, culinary & cafetaria. Ideal for business, single occupancy or small family. 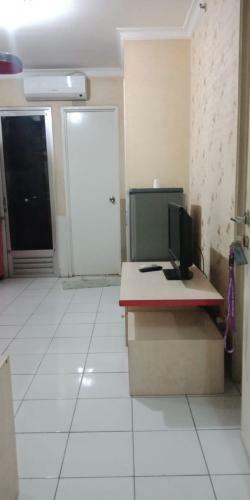 Residence (33 sqm) – 2 BR Unfurnished = IDR 29.000.000/year. 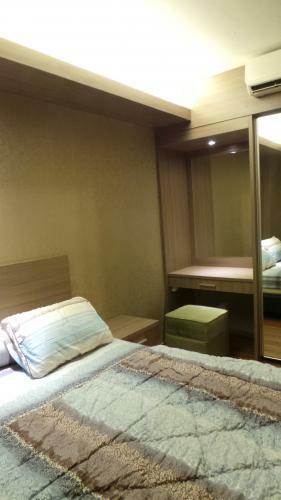 Residence (18 sqm) – Studio Furnished = IDR 3.000.000/month. 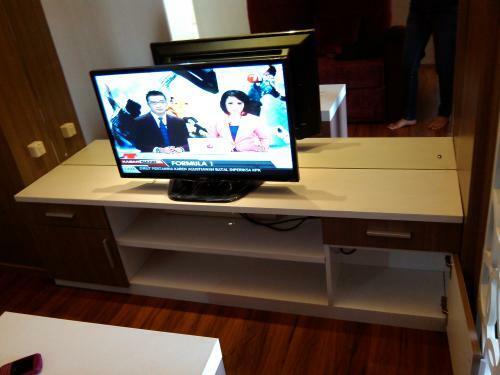 Residence (33 sqm) – 2 BR Furnished = IDR 3.900.000/month. 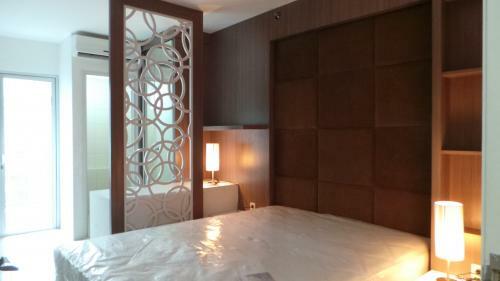 Regency (33 sqm) -2 BR Furnished = IDR 4.000.000/month. 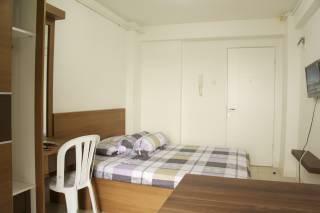 Green Palace (18 sqm) – Studio Furnished = IDR 3.950.000/month. 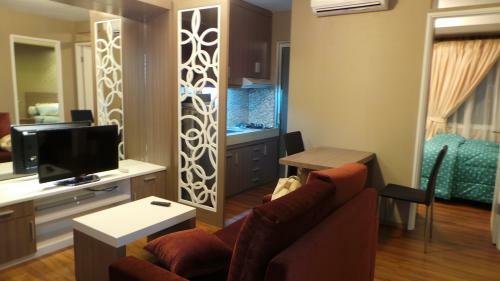 Green Palace (35 sqm) – 2 BR Furnished = IDR 4.500.000/month. 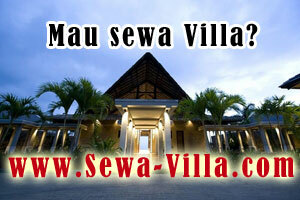 Green Palace (50 sqm) – 3 BR Furnished = IDR 6.950.000/month. Additional security deposit, will be refund after rent period over. Flatware set, ketel electric, aqua bowl. Condition: Furnished. 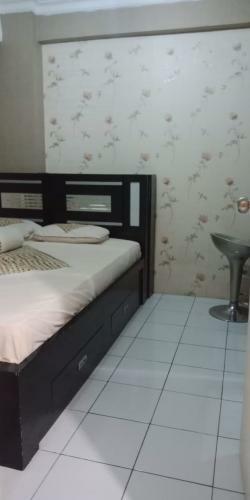 AC, LCD TV, bedroom with spring bed, large wardrobe, stove + gas. Facility: 24-hour security, entrance with access card, fitness center, swimming pool, jogging track, minimart, laundry, walk to Kalibata City Mall (XXI Movie Theater, food center, banks). Additional Info: 5-minute walking to TransJakarta Bus stop, train station, taxi stand. 10-minute driving to Jakarta Central Business District. Residence: AKASIA, BORNEO, CENDANA, EBONI, FLAMBOYAN, GAHARU, DAMAR. Green Palace: LOTUS, RAFLES, VIOLA, PALEM, TULIP, NUSA INDAH, SAKURA, MAWAR. Condition: Nice location, Furnished: 2 A/C unit, Modern kitchen set w/. Cookerhood + stove 2 burn, Kulkas, Sofa 2 seaters, Mini bar & Chairs, AQUA Galon, Wardrobes in master room, Divan & matras + sprei, TV 32″+ Credenza TV, gordyn. 2 Access card, TV cable channels, 24-Hours Security with CCTV & Lift Access, Futsal court & Basket court, Food court with garden view. Facility for Green Palace Apartemen: Lobby Receptionis, Mail Box, Swimming Pool, Fitness, Sauna, Jogging track, Basket & Tennis Court, Gazebo. Near access to Halim Airport. 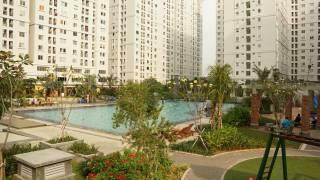 Residence,(33m2)- 2 Bedrooms, kosongan =Rp.29.500.000/year. 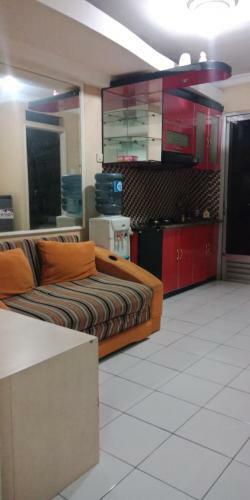 Residence ( 18 m2) – Studio, Furnished =Rp.3.000.000/month. 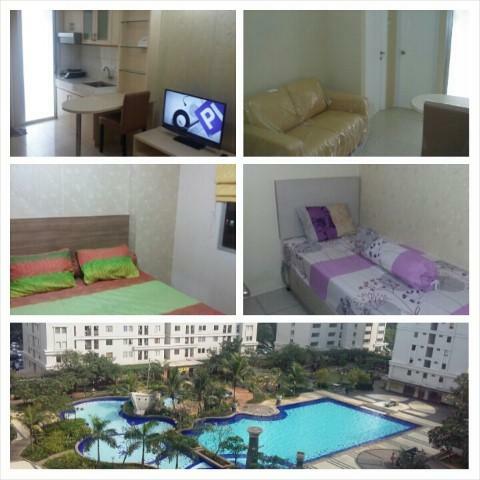 Residence,(33m2)- 2 Bedrooms, Furnished =Rp.3.900.000/month. 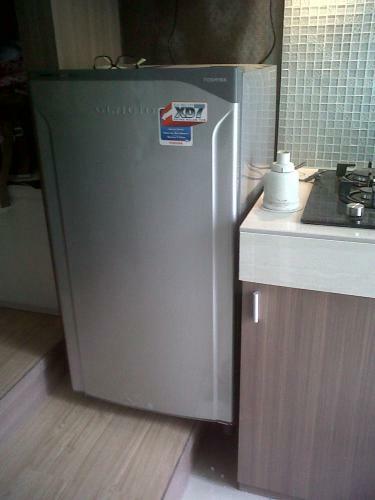 Regency ( 33m2) – 2 Bedrooms, Furnished =Rp.4.000.000/month. 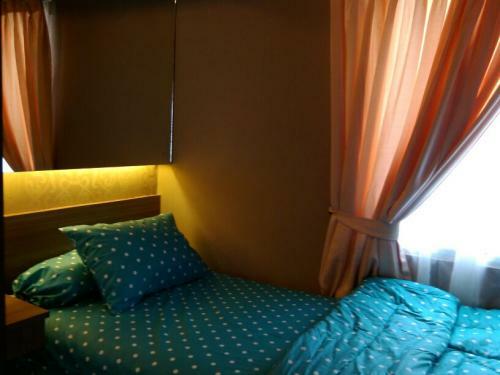 Green Palace ( 18 m2)- Studio,Furnished =Rp.3.950.000/month. 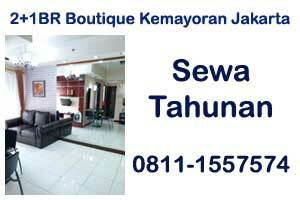 Contact: 0856.971.95816. If the phone does not answer, Please SMS or WA. Condition: Fully furnished and homey apartment unit, ready for occupation. Living Room: Two-seater oscar sofa bed with 4 pillows, 32 inch LED TV HD ready (can play movie or music with USB), TV table, low Watt 2 doors refrigerator, carpet and mat, hot and cold dispenser (low watt)+gallon water, shoes cabinet, wide mirror behind the sofa bed, drop ceiling lamp, 1/2 PK low watt air conditioner, covered with wallpaper. Kitchen: 1,5 meters luxury designed kitchen set with granite table,70 centimeters Modena gas stove 2 burner with 12 Kg gas cylinders, 60 cm Modena slim exhaust hood, Modena kitchen sink, adjusted kitchen taps, glass bar table with 2 chairs and chandelier, trash can, back door curtain, cooking utensils (pot, pan, tea pot, etc), tableware (spoons, plates, forks, etc), and cleaning tool (broom, brush, canebo, dust pan, mop, etc). Main Room: Queen size Airland spring bed + divan, 2 pillows + bolsters and bed linen, headboard with light, 1/2 PK low watt air conditioner, 2 sliding doors wardrobe with mirror, bedside, dressing table with chair, luxury curtain, modified room lights, trash can, mat, covered with wallpaper. Second Room: 100 x 200 cm Airland spring bed + divan, headboard, 2 pillows + bolsters and bed linen, exhaust fan from the main room, 2 sliding doors wardrobe with mirror, study table with chair, modified room lights, trash can, covered with wallpaper. Bathroom: Wide mirror, closet seat, stainless shower and taps, stainless towel rack, mat, trash can, covered with white paint. Facility: National & international TV cable channels, children playground, jogging track, security 24 hours, access card, parking card, centralized gas, parking lot, Kalibata City Square, food court and restaurant, supermarket, ATM center, mosque and sport facility. Additional Info: Facility outside of the Apartment: *Very near to Kalibata Train Station, STEKPI Campus, 15 minutes away from Pancoran and near to business district (Sudirman, Rasuna Said Kuningan, Gatot Subroto, Tebet & MT Haryono), easy access to public transportation (train and bus). Blue Bird taxi pool. 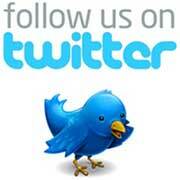 Ideal for students, married couple and small family. *Positions benefit: Gaharu building is the nearest tower from the street and the only one tower which has direct escalator to the Kalibata City Square. The unit (9-CR) is located at the center between 4 lift that operated in Gaharu building. The unit has a wide view area (food Court, garden view). Fully furnished design by Platinum. 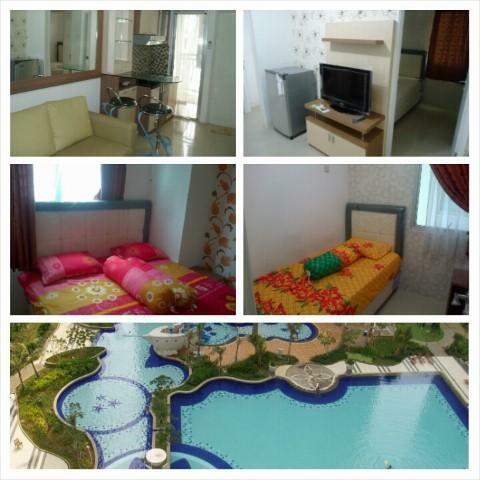 Main bed room with pool view equiped with complete 4 doors wardrobe and Air condition. 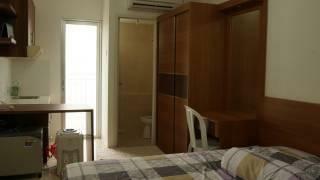 Single bed room with double wardrobe and air condition. 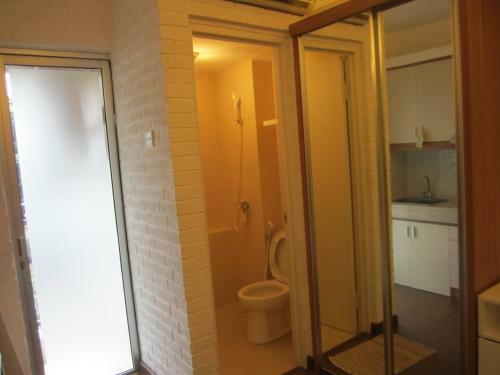 Bathroom with shower and water heater. Kitchen set with dining table. TV cable with WIFI internet. Swimming pool and nice gardening. Basement for car parking, enough space. Swissbell Hotel in apartment yard. Kalibata mall in front of apartment, croosing road. Additional Info: It is in central of Kalibata District and easy access to another district with public transportation system. Pictures will be send to interesting candidate. Annual Charge paid by owner. Monthly maintenance charge paid by rental person.